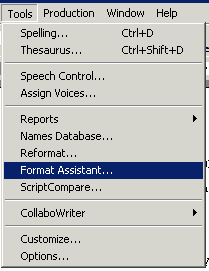 Format Assistant is a program on Final Draft that helps the user either correct or point out formatting errors. 1. Select Tools on the page options and and scroll near the bottom of the tools options. Click Format Assistant. 2. The Format Assistant dialog box should appear.